In today’s episode we’re looking at Ratchet CNI, an implementation of Koko – but in CNI, the container networking interface that is used by Kubernetes for creating network interfaces. The idea being that the network interface creation can be performed by Kubernetes via CNI. Specifically we’re going to create some network isolation of network links between containers to demonstrate a series of “cloud routers”. We can use the capabilities of Koko to both create vEth connections between containers when they’re local to the same host, and then VXLAN tunnels to containers when they’re across hosts. Our goal today will be to install & configure Ratchet CNI on an existing cluster, we’ll verify it’s working, and then we’ll install a cloud router setup based on zebra pen (a cloud router demo). The gist is that the green boxes are Kubernetes minions which run pods, and the blue boxes are pods running on those hosts, and the yellow boxes are the network interfaces that will be created by Ratchet (and therefore Koko). In this scenario, just one VXLAN tunnel is created when going between the hosts. So that means we’ll route traffic from “CentOS A” container, across 2 routers (which use OSPF) to finally land at “CentOS B”, and have a ping come back across the links. Note that Ratchet is still a prototype, and some of the constraints of it are limited to the static way in which interfaces and addressing is specified. This is indeed a limitation, but is intended to illustrate how you might specify the links between these containers. A Kube cluster, spin one up my way if you wish. An operational Flannel plugin in CNI running on the cluster beforehand. It’s worth it for you to note that I use an all CentOS 7 based cluster, which while it isn’t required, definitely colors how I use the ancillary tools and approach things. First thing we’re going to do is on each of the nodes we’re going to use here. In my case it’s just going to be two minion nodes which can schedule pods, I don’t bother putting it on my master. You’ll need to have an etcd instance – if you have a running instance you want to use for this, go ahead. I’ll include my scheme here where I run my own. From wherever you have kubectl available, go ahead and work on these steps. And then create it in the ratchet namespace we just created, and watch it come up. This has also created a service for us. This service is important to the Ratchet configuration. So note how you can access this service – you can use the IP if all else fails, at least for testing that’s just fine. You don’t want to rely on that full-time, however. If your nodes don’t resolve etcd-client.ratchet.svc.cluster.local – pay special attention. As this is the DNS name for etcd I’ll use in the following configs. Now we need to put configurations into place. Firstly, you’re going to want to clear out whatevers in /etc/cni/net.d/, I recommend before getting to this point that you have flannel working because we can do something cool with this plugin available – we can bypass ratchet and pass along ineligible pods to Flannel (or any other plugin). I’ll include configs that have Flannel, here. If appropriate, replace with another plugin configuration. It’s a Flannel config, I’m gonna keep this around for a minute, cause I’ll use it in my upcoming configs. Next, let’s assess what you have available for networking. Mine is pretty simple. Each of my nodes have a single nic – eth0, and it’s on the 192.168.1.0/24 network, and that network is essentially flat – it can access the WAN over that NIC, and also the other nodes on the network. Naturally, in real life – your network will be more complex. But, in this step… Choose the proper NIC and IP address for your setup. [centos@kube-minion-1 ~]$ ip a | grep -Pi "eth0|inet 192"
Ok, cool, so I have eth0 and it’s 192.168.1.73 – these are both going into my Ratchet config. etcd_port is the port on which etcd will respond. child_path points where the secondary binary for ratchet lives, following these instructions this is the proper path. parent_address is the IP address remote VXLANs will use to create a tunnel to this machine. use_labels should generally be true. delegate is a special field. In this we pack in an entire CNI config for another plugin. You’ll note that this is set to the exact entry that we have earlier when I show the current config for CNI on one of the minions. When pods are not labeled to use ratchet, they will use this CNI plugin (more on the labeling later). boot_network – similar to delegate but when pods are eligble to be processed by Ratchet, they will have an extra interface created with the CNI config as packed into this property. In this case I just set a loopback device, using the loopback CNI plugin. Great! You’ve got one all set. But, you need two. So setup another one on a second host. [centos@kube-minion-2 ~]$ ip a | grep -iP "(eth0|192)"
Note that the IP address in parent_address matches that of the address on eth0. Alright, something we’re going to want to do is to specify which pods run where for demonstrative purposes. For this we’re going to use nodeSelector to tell Kube where to run these pods. We are now all configured and ready to rumble with Ratchet. Let’s first create a couple pods to make sure everything is running. These are how ratchet knows how to setup the interfaces on the pods. You set up each pod as pairs. Where there’s a “primary” and a “pair”. You need to (as of now) know the name of the pod that’s going to be the pair. Then you can set the names of the interfaces, and which IPs are assigned. In this case we’re going to have an interface called in1 on the primary side, and an interface named in2 on the pair side. The primary will be assigned the IP address 192.168.2.100 and the pair will have the IP address 192.168.2.101. Of all of the parameters, the keystone is the ratchet: "true" parameter, which tells us that ratchet should process this pod – otherwise, it will pass through the pod to another CNI plugin given the delegate parameter in the ratchet configuration. And then watched it come up with watch -n1 kubectl get pods. Once it’s up, we can check out some stuff. But – you should also check out which nodes they’re running on to make sure you got the labelling and the nodeSelector’s correct. You can do this by checking out the description of the pods, and looking for the node values. $ kubectl describe pod primary-pod | grep "^Node"
$ kubectl describe pod pair-pod | grep "^Node"
Now that you know they’re on differnt nodes, let’s enter the primary pod. [root@primary-pod /]# ip a | grep -P "(^\d|inet\s)"
lo which is a loopback created by the boot_network CNI pass through parameter in our configuration. in1 which is a vxlan, assigned the 192.168.2.100 IP address as we defined in the pod labels. You can see that it’s a vxlan with an id of 11, and the remote side is @ 192.168.1.33 which is the IP address of the second minion node. That’s looking correct. PING 192.168.2.101 (192.168.2.101) 56(84) bytes of data. Excellent! All is well and good, let’s destroy this pod, and shortly we’ll move onto the more interesting setup. Ratchet is in need of some clean-up routines of its own, and since they’re not implemented yet, we have to clean up the etcd data ourselves. So let’s do that right now. Next, we’re going to run a more interesting setup. I’ve got the YAML resource definitions stored in this gist, so you can peruse them more deeply. Let’s download those yaml files. Now, create the first part, and let the pods come up. Then you can create the second part, and watch the last single pod come up. PING 192.168.4.101 (192.168.4.101) 56(84) bytes of data. Hurray! Feel free to go and dig through the rest of the pods and check out ip a and ip -d link show etc. Also feel free to enter the quagga pods and run vtysh and see what’s going on in the routers, too. This is the very short version, but, there’s basically two places you want to look to see what’s going on. journalctl -u kubelet -f will give you the output from ratchet when it’s run by CNI proper, this is how it’s initially run. tail -f /tmp/ratchet-child.log – this is the log from the child process, and likely will give you the most information. Note that this method of logging to temp is an ulllllltra hack. And I mean it’s a super hack. It’s just a work-around to get some output while debugging for me. I’d recently brought up my GlusterFS for persistent volumes in Kubernetes setup and I was noticing something errant. I had to REALLY baby the persistent volumes. That didn’t sit right with me, so I refactored the setup to use gluster-kubernetes to hook up a hyperconverged setup. This setup improves on the previous setup by both having the Gluster daemon running in Kubernetes pods, which is just feeling so fresh and so clean. Difference being that OutKast is like smooth and cool – and I’m an excited spaz about technology with this. Gluster-Kubernetes also implements heketi which is an API for GlusterFS volume management – that Kube can also use to allow us dynamic provisioning. Our goal today is to spin up Kube (using kube-ansible) with gluster-kubernetes for dynamic provisioning, and then we’ll validate it with master-slave replication in MySQL, to one-up our simple MySQL from the last article. If you’re not familiar with persistent volumes in Kubernetes, or some of the basics of why GlusterFS is pretty darn cool – give my previous article a read for those basics. But, come back here for the setup. The bulk of the work I was able to do here was thanks to the gluster-kubernetes setup guide, which helps you use the tool embedded in that project called gk-deploy. This article (and the playbook) leans on gk-deploy quite a bit. I’d also like to thank @jarrpa for some help he gave when I ran into some documentation snags bringing up gluster-kubernetes. In short, I recommend my usual setup which is a single CentOS 7 machine you can run VMs on. That’s what I typically use with kube-ansible. You’re going to need approximately 100 gigs of disk. You’ll run 4 virtual machines (one master and 4 minions). I personally use 2 vCPUs per VM, you’d likely get away with one. Otherwise, you can also use this on baremetal, just skip the VM portion of kube-ansible. The tricky part is the that kube-ansible currently only supports a single disk for this setup, and it’d need to be the same name on all baremetal hosts. If you do give it a go, just change the name of the disk in the spare_disk_dev in the ./group_vars/all.yml in your kube-ansible clone. And, you’ll need some disks that are free-and-clear of data, and not mounted on your machines. kube-ansible can set this up for you in VMs. I’m also happy to take some pull requests to improve how this works against baremetal! Also, as per usual, I assume a CentOS 7 distro on all nodes. And while you might be able to do this with other distros that it colors how I approach this and what ancillary tools I select. Lastly, you need a client machine you can run Ansible on, and must have Ansible installed. But, why? Isn’t the previous article’s method just fine? First and foremost – the original article I wrote didn’t have heketi – the API that we’re going to have Kube use to dynamically provision Gluster volumes. That’s not as good. The other thing was cleanliness. It was kind of two ways of managing applications – one running on the host operating system, and the others in containers. Just not nearly as clean. Lastly, it required that you baby some of the volumes. For example, you’d have to specify new persistent volumes, and then make claims against them. Now we can have claims against a new Kubernetes storageclass, and that storage class will specify that we talk to Heketi, like in this example. Also, we use the gk-deploy tool from gluster-kubernetes here, and it can do a number of things that we just don’t have to maintain anymore – such as “peer probe” all the gluster nodes; which gets them all connected to one another and cooperating. This begs the question – is there an advantage to running it on the host? I don’t think there is. This has all the pieces that has, it just happens to have them running in containers on the host. Since you’re running Kubernetes – I think that’s an advantage. I’ll give a quick review of kube-ansible. If you want a more thorough tutorial check out my article on using it. The most difficult part is just modifying the inventory, and that’s not even that tough. Remember the gist here is that we have a single host that can run virtual machines (which we call the “virthost”, and this playbook has the setup for running those), and then we run virtual machines on which we run Kubernetes (generally for laboratory analysis, in my own case). And set the eth0 to whatever your primary NIC is named (e.g. if you have multiple NICs, it’s likely in your lab this would be the NIC that can access the internet). And set the CIDR for it too. Of course, at the top set the IP address of this host. Modify the ./inventory/vms.inventory. In the first four lines, put the IP addresses you got from the last step. Then, the last line point the ansible_ssh_private_key_file variable at the path to the SSH private key you got from the previous step. And lastly – comment out the ansible_ssh_common_args line, you don’t need that now. Now you can install Kubernetes. Alright, you’re good to go – now onto the good stuff. Here’s the easy part – just one more playbook to run. Then we can go from there. This is going to do everything you need to have glusterfs running on each of the minion nodes. The (at least mock) hyperconverged storage situation is coming now. If you’re not familiar with that terminology – the shortest explanation is that your storage resides on the same hosts as where you run your computational workloads. Awesome. Great – that’s a whole bunch of magic, what the heck did that playbook actually do!? If you want to see it in stark detail, checkout the ./roles/glusterfs-kube-config/tasks/main.yml file which has all of what it does. You can also check out an example, if you’d like. Installs the heketi CLI application on the kube master. Formatting disks and creating volume groups, etc. Configuring GlusterFS more deeply and manually peering the endpoints. Alright cool, well, you just hung out for a while waiting for that GlusterFS playbook to run (not to mention, an entire Kubernetes install). Which makes me believe that you’re sufficiently coffee-i-fied at this point. Because of that, we’re going to pick something a little bit more ambitious this time for an example usage of these persistent volumes. Last time we used MariaDB, this time, we’re going to use MySQL with replication. If you’re interested more deeply in how to do this, check out the k8s docs on running replicated mysql using stateful sets. That’s the origin of my example, but, I have some modified resource definitions here that are specific to what we just spun up so you don’t have to read through every line. However, it is actually fairly interesting to check out, so I do encourage it. Firstly, let’s curl down those resource definitions. I also have them in a GitHub Gist. Ok, let’s get the files. Create from all of those. It takes a bit to spin up, since it’s a stateful set, the pods come up ordered for us, which is nice for a replicated setup. So make sure to do a watch -n1 kubectl get pods (or even a kubectl get pods --watch). Now, we can do cool stuff with it. Let’s create a table based on… Honey bees (I keep bees but these numbers aren’t representative of anything scientific, just FYI). Feel free to use whatever data you’d like. Ok, that’s all well and good, now, let’s check that the replicated members have data. [centos@kube-master ~]$ kubectl run mysql-client --image=mysql:5.7 -i -t --rm --restart=Never -- mysql -h mysql-read --execute "SELECT * FROM beekeeping.hive"
Now, let’s have fun and tear it down, and see if we still have data rollin’. In this episode – we’re going to do some “service chaining” in containers, with some work facilitated by Tomofumi Hayashi in his creation of koko and koro. Koko (the “container connector”) gives us the ability to connect a network between containers (with veth, vxlan or vlan interfaces) in an isolated way (and it creates multiple interfaces for our containers too, which will allow us to chain them), and then we can use the functionality of Koro (the “container routing” tool) to manipulate those network interfaces, and specifically their routing in order to chain them together, and then further manipulate routing and ip addressing to facilitate the changing of this chain. Our goal today will be to connect four containers in a chain of services going from a http client, to a firewall, through a router, and terminating at a web server. Once we have that chain together, we’ll intentionally cause a failure of a service and then repair it using koro. I’d like to point out that this is not exactly “service function chaining” (SFC) – we can let sdxcentral define that for you. From what I understand is that pure SFC uses a “network service header” (which you can see here from IETF) to help perform dynamic routing. This doesn’t use those headers, so I will refer to it as simply “service chaining”. You can think of it as maybe some related tools and ideas to build on to achieve something more like a proper SFC. In fact… We’re going to perform a series of steps here that are quite manual, but, to demonstrate what you may be able to automate in the future – and my associate Tomofumi has some machinations in the works to do such things. We’ll cover those later. Now that we’ve establashed we’re going to chain some services together – let’s go ahead and actually chain ‘em up! We’re going to spin up 4 containers, and chain the services in them. All the network connections are veth created by koko. Here you can see we’ll have 4 services chained together, in essence an HTTP request is made by the client, passes the firewall, gets routed by the router, and then lands at an HTTP server. All of these services run in containers, and the network connections are veth, so all of the containers are on the same host. The firewall is just iptables, and the router is simply kernel routing and allowing ip forwarding in the container. These are shortcuts to help simplify those services allowing at us to look at the pieces that we use to deploy and manage their networking. I tried to put in an example with DPI, and I realized quickly it was too big of a piece to chew, and that it’d detract from the other core functionality to explore in this article. Note that this article assumes you have setup left-over from this previous how-to blog showing koko+vpp. If you’re not interested in the VPP part (we don’t use it in this article) you can skip those sections, but, you will need koko & koro installed and Docker. This setup could be further extended and made cooler by making all vxlan (or maybe even vlan) connections to the containers and backing them with the VPP host we create in the last article. However, it’s a further number of steps, and between these articles I beleieve one could make a portmanteau of the two and give that a whirl, too! Tomo has other cool goodies in the works, and without spoiling the surprise of how cool what he’s been designing, the gist is that they further the automation of what we’re doing here. In a more realistic scenario – that’s the real use-case, to have these type of operations very quickly and automatically – instead of babying them at each step. However, this helps to expose you to the pieces at work for something like that to happen. Ok, let’s have a warm-up quick. We can go through the most basic steps, and we’ll operate a firewall. So here we’ll create two endpoints with a firewall between them. This part is optional and you can skip down to the next header. But, I encourage you to run through this quick, it won’t take extra time and you can see stepwise how koro is used after, say, not using it. I’m going to use someone’s dockerhub iptables, and here’s the Dockerfile should you need it. Now run that image, and two more. We can use koko to connect them together with veth connections. Then you should be able to ping 10.0.2.2 from test1. Now let’s block icmp, to make sure iptables is working, needs to go into the FORWARD table. Cool, those are the working bits, minus koro. So let’s bring in koro. First, delete those containers (this removes ALL the containers on the host). Run those containers again, and now use koko but without assigning IP addresses. Alright, now, you’ve gotta still set ip forwarding on the iptables container. We’ve got links now, but, no ip addressing. Koro should be able to fix this up for us. Let’s add a default route to test1 & 2. With those in place, we can now ping across the containers. Note that those are all containers, and the interfaces created in them are veth pairs. With that in hand – let’s spin up all the pieces that we need. Pull my dougbtv/pickle-nginx, we’ll use that. Now, let’s run all the containers. And run a docker ps to make sure they’re all running. Ok, these need a bit of grooming. Firstly, we need IP forwarding on the firewall and router. And now we’ll add addresses to them all. And we’re going to need some more routing. Now we have a service chain! Huzzah! You can curl the nginx. Let’s cause some chaos, some mass confusion. It’s all well and good we have these four pieces all setup together. However, the reality is… Something is going to happen. In the real world – everything is broken. To emulate that let’s create this scenario – the firewall goes down. In a more realistic scenario, this pod will be recreated. For this demonstration we’re just going to let it be gone, and we’ll just create new links with koko directly to the router, and then re-route. Note that the firewall winds up failing and is gone, and we’ll fix the routing and ip addressing surrounding it to patch it up. That should do it. Alright now we can’t run our same curl, it fails. We can use koko & koro to fix this up for us. Let’s create some new interfaces with koko. We’ll also just use a new subnet for this connection (we could finesse the existing, but, this is a couple steps less). Go ahead and create that veth pair. Now, we’ll need some IP addresses, too. And we have to fix the client containers default route. We don’t have to delete the existing default route because it went down with the interface – since a veth is a pair. (In a vxlan setup, we’d have to otherwise detect the failure and provide some cleanup), so all we have to do is add a route. And – we’re back in business, you can curl the pickle-nginx again. Using the basics from this technique for a failed service in a container you could make a number of other operations that would use the same basics, e.g. other failure modes (container that is died is replaced with a new one), or extensions of the service chain, say… Adding a DPI container somewhere in the chain. The purpose of this is to show the steps manually that could be taken automatically – by say a CNI plugin for example. That could make these changes automatically and much more quickly than us lowly humans can make them by punching commands in a terminal. 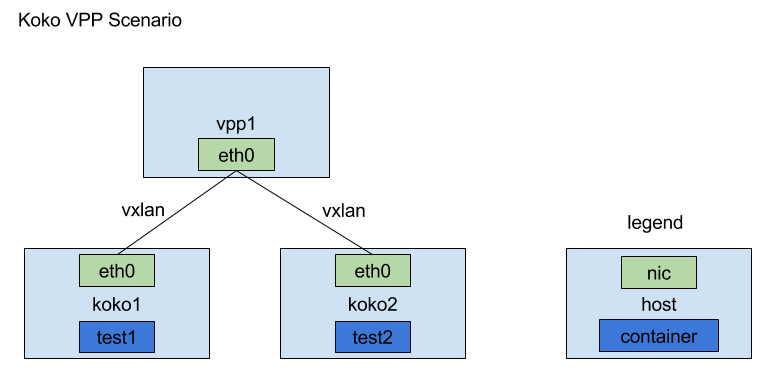 Using Koko to create vxlan interfaces for cross-host container network isolation -- and cross-connecting them with VPP! I’ve blogged about koko in the past – the container connector. Due to the awesome work put forward by my associate Tomofumi Hayashi – today we can run it and connect to FD.io VPP (vector packet processing), which is used for a fast data path, something we’re quite interested with in the NFV space. We’re going to setup vxlan links between containers (on separate hosts) back to a VPP forwarding host, where we’ll create cross-connects to forward packets between those containers. As a bonus, we’ll also compile koro, an auxillary utility to use with koko for “container routing”, which we’ll using in a following companion article. Put your gloves on start up your terminals, we’re going to put our hands right on it and have it all up and running. Since we’ll be in the thick of it here, it’s almost free to compile koro while we’re at it. I’m excited to put my hands on koro, and we’ll cover it in the next article (spoiler alert: it’s got service chains in containers using koko and koro!). I’ll refer to the build for koro here for those looking for it. The gist we’ll build three boxes (I used VMs), and we’ll install VPP on one, and the two other hosts are container hosts where we run containers that we’ll modify using koko. When we deploy VPP, we are deploying it directly on the host, and not in containers. Also, the containers use VXLAN interfaces that have pairs on the VPP host. This isn’t a limitation per-se, but, more that in the future we’d like to explore further the concepts around user-space networking with containers – so it can feel like a limitation when you know there’s more territory to explore! Note that this is a manual process shown here, to show you the working parts of these applications. A likely end goal would be to automate these processes in order to have this happen for larger, more complex systems – and in much shorter time periods (and I mean MUCH shorter!) Tomo is working towards these implementations, but I won’t spoil all the fun yet. For my setup, I used 3 boxes… 4 vcpus, 2048 megs of ram each. I assume a CentOS 7 distro for each of them. I highly recommend CentOS, but, you can probably mentally convert to another distro if you so please. Also, I used VMs, VMs or baremetal will work – I tend to like this approach to spinning up a CentOS cloud image with virsh. Time to install VPP – it’s not too bad. But, one of the first things you’re going to need to do is enable hugepages. That should do the trick and live through a reboot. That’s what mine looked like. I also recommend, optionally, to reboot at this point to make sure it sticks. You didn’t properly setup huge pages in the first steps. For what it’s worth I got a few hints from this fd.io jira issue. Important We’re going to bring an interface down on this machine, which may impact your ability to ssh to it. In my case, it’s just virtual machines with a single nic. That being the case, I assigned root a password (e.g. sudo su root and then passwd) then logged into the box with virsh console vpp1 and did a ifdown eth0, then ran make run. The interface will show as being in a down state in vpp, but, it shows up in the list. Great! We’re mostly there. We’ll come back here to setup some vxlan and cross-connects in a little bit. Ahhh, go apps – they’re easy on us. We don’t need much to do it, mostly, we need git and golang, so go ahead and install up git. However, for the latest editions of Koko we need go version 1.7 or greater for koko (as documented in this issue). We’ll use repos from go-repo.io – which at the time of writing installs Go 1.8.3. Install the .repo file and then just say let’s install golang. Set up your go path. And go ahead and clone koko. Get the koko deps, and then build it. That results in a koko binary in the $GOPATH/bin. So you can get some help out of it if you need. See https://github.com/redhat-nfvpe/koko/wiki/Examples for the detail. Alright, so assuming you’ve got koko installed, you’re most of the way there, using the same installed applications and set $GOPATH, you can now clone it up. Get the deps, build it, and run the help. You’re going to need an up-to-date docker for koko to perform at its best. So let’s get that up and running for us. These instructions are basically the verbatim docker instll instructions for Docker CE on CentOS. Now go ahead, and compile koko and koro and install Docker on the second koko host. Alright, let’s start some containers. First, we’ll pull my handy utility image (it’s just centos:centos7 but has a few handy packages installed, like… iproute). Do that on both hosts, koko1 and koko2, and now we can run that rascal. Now, let’s connect those to a vxlan interface using koko, on the first koko host. /home/centos/gocode/bin/koko is the path to the compiled koko binary. eth0 is the parent interface that exists on the host. 192.168.1.223 is the address of the VPP host. 11 is the vxlan ID. It’s all well and good that the containers are setup, but right now they’re in a state where the vxlan isn’t actually working because the far end of these, the VPP host, isn’t aware of them. Now, we’ll have to set this up in VPP. Go back to your VPP console. We’re going to create vxlan tunnels, and keep your cli docs for vxlan tunnels handy. 192.168.1.223 is the vpp host itself. 192.168.1.165 is koko1, and 192.168.1.143 is koko2. 11 & 12 are the vxland IDs we have chosen. And that’s all well and good, but, it’s not perfect until we setup the cross connect. Ok, now… Let’s exec a ping in the test1 container we created and applied koko to. Should be good to go! Excellent! Next up we’re going to take some of these basics, and we’ll demonstrate create a chain of services using koko and koro. I’ve recently been interested in the idea of extending the scheduler in Kubernetes, there’s a number of reasons why, but at the top of my list is looking at re-scheduling failed pods based on custom metrics – specifically for high performance high availablity; like we need in telecom. In my search for learning more about it, I discovered the Kube docs for configuring multiple schedulers, and even better – a practical application, a toy scheduler created by the one-and-only-kube-hero Kelsey Hightower. It’s about a year old and Hightower is on his game, so he’s using alpha functionality at time of authoring. In this article I modernize at least a component to get it to run in the contemporary day. Today our goal is to run through the toy scheduler and have it schedule a pod for us. We’ll also dig into Kelsey’s go code for the scheduler a little bit to get an intro to what he’s doing. Fire up your terminals, and let’s get ready to schedule some pods – with the NOT the default scheduler. What, what’s a scheduler? crond? So in this case – the “work specified by some means” is our containers (usually Docker containers), and the resource they’re assigned do – are our nodes. That’s a big thing that Kube does for us – it assigns our containers to nodes, and makes sure that they’re running. If you want to read more about exactly what the default scheduler in Kubernetes does, check out this readme file from the kube repos. Simply have a Kubernetes 1.7 up and running for you. 1.6 might work, too. If you don’t have Kube running, may I suggest that you use my kube-ansible playbooks, and follow my article about installing a kube cluster on centos (ignore that it says kube 1.5 – same steps will produce a 1.7 cluster). Also, I use an all-CentOS 7 lab environment, and while it might not be required, note that it colors the ancillary tools and viewpoint from which I create this tutorial. We’ll install a few deps, I wound up with a Go version 1.6.3, which appears to work fine, for your reference. I’m performing these steps on my kube master, feel free to run them where’s appropriate for you. You’ll need to install some packages, and you’ll need to be able to use the kubectl utility in order to perform these. Now, make yourself a dir for your go source. Now let’s clone up Hightower’s code into there. Alright now that we’re there, first thing we’ll do is build the annotator. Which will produce a binary for us. Now, go and build the scheduler proper. Go makes it easy, right!? We need to run a kubectl proxy, which is a HTTP proxy to access the kube API – our scheduler here will rely on it. You can exit this screen and let it keep running by hitting ctrl+b then d. To return to the screen execute tmux a.
Alright, we’re going to create some “prices” for each of our nodes. The scheduler will use this and then start the pods on the node with the lowest price. Cool, good it shouldn’t have started yet. Feel free to run this in a tmux screen, but, I ran it in it’s own window. Hurray! It scheduled it to kube-minion-2 if you look at our pricing output, you’ll see that is the lowest priced node when we generated prices. Run a kubectl get pods to double check and you can pick up the IP address with a kubectl describe $the_pod_name and curl it to your heart’s content. And generate new prices with ./annotator/annotator and run the scheduler again, and see it schedule it to another place when you kubectl create -f it. Let’s inspect the toy scheduler go code. So let’s take a look at the code in the toy scheduler. This is really a gloss-over, but maybe can help point you (and later me!) in the right direction to figure out more about how to use these concepts to our own advantages. processor.go: Where our goroutines live. bestprice.go: Our metric for scheduling. These handle the goroutine logic (e.g. working with the wait group), perform a wait operation (I assume for polling for the rest of the logic), and then call the schedulePod() method also in processor.go. The monitorUnscheduledPods() also calls the method watchUnscheduledPods() from kubernetes.go which is looking for those unscheduled pods for us (looks to be polling, but, there’s some things named “event” which makes me wonder if it has a watch on those events, I’m unsure and I didn’t dig further for now). The watchUnscheduledPods() method returns a channel to the pods it discovers. When there’s a pod to be scheduled, finally a bind() method is called from kubernetes.go – this calls the binding core in Kubernetes API, which can bind a pod to a node, for example. The processor also looks at the bestPrice() method, which is in bestprice.go – this look at the “prices” for each node and returns the lowest value price, this is how we determine which pod is going to go where.